A recent post from PW Cooks on her 1981 recipe book triggered memories of my favorite recipe book, coincidentally from the same year. It was my sophomore year of high school. I was in my sewing class and someone passed around a blank copy of this book, "My Favorite Recipes." It was just before Christmas and I needed a gift for my mom. I was always writing down recipes for my mom, as she told me that I "had great handwriting." Voila! What a great idea! 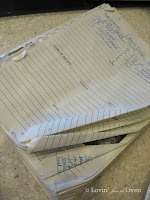 I'll give one to my mom...filled with my handwritten recipes! For myself. As an early Christmas present. My mom's soft sugar cookie recipe. It was a holiday favorite. My mother-in-law's Italian Pasta Salad. In college, I had 6 roommates that loved to cook. I have their recipes, too. Alison's Cheese Soup and Parmesan Chicken. Erin's Mint Cookies and Broccoli Chicken. Steph's Congo Bars and Chocolate Eclairs. There's even Robert's Chocolate Chip Cookies. He wasn't a roommate, but he made cookies for us one time. Cream cheese was his secret ingredient. You can tell the recipes that I used often...there's splashes of vanilla, raw egg, and blurred words...mostly in the dessert section. I can't give up this book. It holds too many memories! 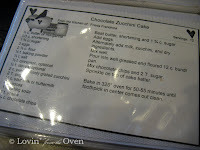 But it was getting hard to read some of the recipes in the midst of the crinkles and splashes. What to do? Then this caught my eye. It was 1993. The price caught my eye, too. But I'm pretty sure that I'm not the first person to think of this. I opened up the photo album and made a slit with an Xacto knife inside the front cover, down the spine. I took out the original cover and inserted my own. This was pretty good graphics for 1993! And slipped them in between the pages. Ahhhhhh. It felt so good! It was so great! Now my family knew which chocolate chip cookie recipe (out of the 10 or so that I've collected) to use and it was vanilla stain proof, too! It has served me well for the past 16 years. The spine is coming apart. 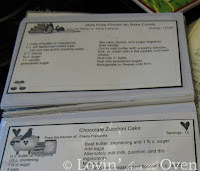 This is why I have printable recipes in 2 formats: 4x6 (for my mom) and full page for others. I guess I'm ready for a new method. My DREAM is to have a touch screen flat panel computer monitor that tucks underneath my kitchen cabinet. When I want a recipe, I just pull out the monitor, touch it with my dusty floured fingers, and Voila! the recipe I want is there! So, what do you do? 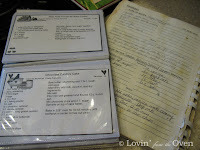 Do you hand write your recipes, highlight them in cookbooks, put them in your computer or do you scrapbook them? I would love to hear from you! I wish I were half so organized! I have a recipe file that has all the old family faves in it, but other that that, they are scattered. I try to keep them on the computer, but I forget. A lot of them are on my blog and it's pretty pathetic that I have to go look up my own recipes on my blog! Donalyn, I admit, I go to my blog to find recipes! It's also great when others ask for a recipe, I just say, "it's on my blog.." Thanks for commenting! My grandmother gave me a Cookie cookbook in my early teens. I liked to bake. Later, mostly in college as I wrote down a recipe of clipped one I would stick it inside the front cover of the book. Eventually the pile of recipes started to break the binding. So I moved them to a qt. zipper bag. I added some dorm and published cookbooks to the mix and eventually had enough to fill a copy paper box as I moved from place to place. Then 5-6 years ago my oldest niece was graduating high school. So I compiled my favorites from the zipper bag with favorites from my siblings and their spouses and some from our grandparents. 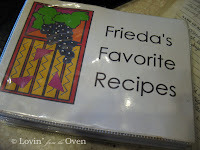 I then had this family cookbook published and passed the recipes on to the next generation. I continue to collect recipes from friends, TV shows and family.I have a bunch of recipes printed off and folded up, stuck in my cupboard next to my most used cookbooks. I like the photo album and binder ideas. I should really do that. 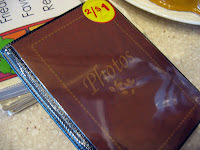 I have a three-ring binder with sheet protectors too, but I wanted to add photos more simply. That's when I started blogging--it's been the easiest way to track what I've cooked and how it worked. I still keep my binder though. Great and lovely idea, I 'll try to organize my recipes in something like that, but I have to confess that I never do.